I have always disliked using serial console connection to a switch or other network device with my laptop. The serial cable just ties me to that particular place and device. Depending on the situation you may have options like using a console server or a dedicated management network connection. But every now and then the serial console connection is needed anyway from the laptop, like when first configuring something, having a maintenance break or just labbing up. USB console connections are maybe getting more common but I haven’t had the honor yet to see it in any of the devices I’ve had to console in. Nowadays we don’t even have serial ports in laptops anymore so an auxiliary gadget is needed: a USB port to serial port adapter. And that creates another pain: There are major differences in USB-serial adapters regarding their OS support and driver stability. BSODs have been common with some drivers and adapters. I’ve witnessed a case where a network specialist was dealing with a major network issue but the access to the affected switch (and hence the progress of the whole incident) was severely disrupted due to the laptop crashing all the time due to the USB-serial adapter. Luckily there was another specialist nearby who had a USB-serial adapter of another brand, and the case could be resolved right away. Due to all these reasons I wanted something different: a Bluetooth serial adapter. 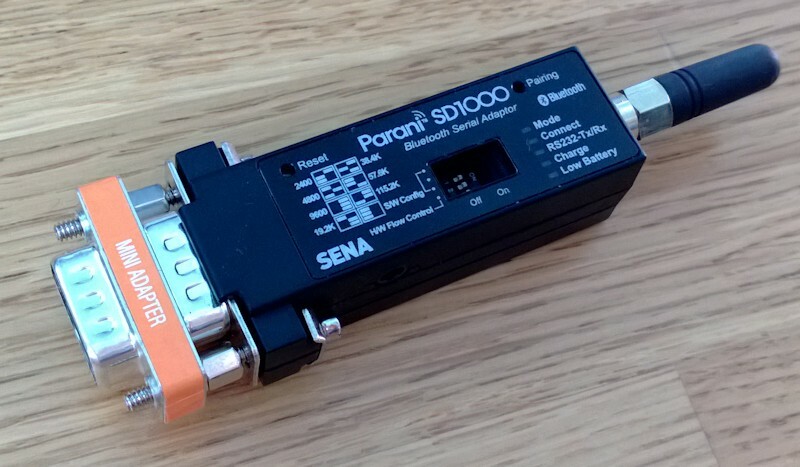 After some delivery and communication problems (neither of those – delivery or communication – really happened) with one store I managed to place an order in another store for Sena Parani-SD1000 (www.senaindustrial.com; updated the link at 14-Jul-2014) adapter with accessories. There are several ways to use these kind of adapters, like replacing a long serial-to-serial cable by using two of these adapters and pairing them together. In my case I’ll just use my laptop’s built-in Bluetooth feature to pair with SD1000 so I need only one of these adapters. And, there is no special driver required to run it! Just the normal Bluetooth stack software. Sena Parani-SD1000 Bluetooth serial adapter, with the DB9 female-to-male converter and stub antenna connected. pin 9 of DB9 connector (it’s up to your serial device). The pin 9 option means that in some cases you don’t have to do anything special to get the thing powered, just plug it in the serial port. To be on the safe side (my guess is that Cisco-style RJ-45 console ports don’t deliver the power) I ordered the Standard battery with my adapter. The AC power adapter is not necessarily included, depending on the package, and the battery is not part of any manufacturer-provided packaging, it has to be purchased separately. In addition to the Standard battery there is also an Extended battery available. As expected the battery makes it possible to use the adapter without connecting external DC source. According to the specifications the Standard battery is supposed to last about 4.5 hours and the Extended battery about 16.5 hours, depending on the usage. If the battery is not present (or is empty) and pin 9 power is not available, a DC source is obviously needed. The battery will automatically charge when whatever DC power is connected. The Standard battery is very slim and doesn’t practically add any weight to the adapter (which is light as such anyway). It’s only a couple of millimeters thick and can be seen below attached to the bottom of the adapter. Sena Parani-SD1000 with the Standard battery pack attached. The DC connector is also shown here. The power switch is a proper hardware switch and it is located on the opposite side of the adapter. The serial connector is female DB9, which means that if you want to connect it to a Cisco-supplied rollover console cable you need to use the included female-to-male converter. Not a big deal. In addition to the rollover cable I carry a DB9-RJ-45 adapter with me so that I can plug the rollover cable to a DB9 device as well. You may ask why I wanted to do that as the adapter itself already provides a DB9 interface. There are two reasons I presume I’ll use the cable anyway: First, if I’m working far enough from the adapter I can position the adapter with the serial cable to a better place for larger Bluetooth range. The second reason is the battery charging: If the battery is empty (and pin 9 power is not available) I can maybe find a USB port somewhere near so that I can power and charge the adapter while using it. The USB-to-DC cable is only about 30 cm so that may not be enough alone. And I need some kind of rollover cable anyway with me so the small adapter is not too much to have in the bag anyway. The rollover cable can be shortened if needed. As you can see from the topmost image there are some buttons in the adapter. The power switch is not shown, it is on the side of the adapter. The DIP switches are used to set the serial port speed and flow control, and the speed can also be controlled in software. Basically the adapter also obeys some AT commands. I haven’t touched them, read the manual from the manufacturers site if you’re interested. I just set the switches to 9600 bps and continued. Keeping the Pairing button pressed a couple of seconds using a paperclip it starts to look for a partner. At this point the Bluetooth discovery can be started in the computer. The adapter presents itself as “SD1000v2.0.8-xxxxxx”. After pairing there were two COM ports added in Windows 7. I don’t actually know yet why there are two ports, I have just used the first of them (COM8) and been happy with it. The PIN code was 1234 and it can probably be changed with some AT commands. In the following uses it is enough to just switch the adapter power on and it will automatically pair with the last partner. Again, there can be some even more sophisticated logic but that’s how I’ve used it this far. The console connections with laptop cannot get any easier than this! The few occasions I have used the adapter so far I’ve been extremely happy with it. It is easy to use and gives me the flexibility I wanted. The price (about 130 EUR with all the accessories above and shipping from Sweden to Finland) is quite high but good stuff always tends to cost something. I got mine from LAWICEL (www.lawicel-shop.se). I haven’t really explored all the adapter options yet. For example, the data sheet says it supports up to 4 simultaneous connections. I guess that is something good. It is very nice to see this effort. I am trying to communicate this device between arduino mega 2560 and PC (attached parani SD1000U USB). But I am struggling hard to get the communication. There are errors called: Receive message: timeout. when I am trying to upload the program to the serial port. (COM 17). Can you please help me in this regard.? Hi Irfan, unfortunately I don’t have any experience on the USB model of the device. If I understand this correctly you have plugged SD1000U on the Arduino. Are you sure it should work on Arduino at all? Some kind of drivers are presumably needed (built-in or customized, depends on the kernel I would assume). I would at least try to run some kind of terminal emulator (like Minicom and Putty) on both sides to be sure that basic-level communication is happening if possible before doing anything more exotic. Just got one of these a few weeks ago, and man its AWESOME. Makes working in the data center so much more comfortable! I’ve used this sitting like 4 rows away without any issues. Hardest part is getting it setup at first on OSX, and remembering to turn it off when I’m done so I don’t kill the battery. I’ve been using the SD1000’s with the extended battery pack for years. Since these are class 1 Bluetooth you should try a micro usb class 1 Bluetooth dongle. it’ll increase the range dramatically. Hi, Can SD1000 work on with Modbus RTU protocol. 5. Once I open securecrt or putty serial connection using COM9 , the connect starts flashing and all appears good. 7. I type enter and I do get the router prompt, all still appears good at this point. 8. HOWEVER once I type sh run or some other command with longer output the connects stops flashing and the mode starts flashing 2 times and my connection is dead. Omega, sorry to hear that. Have you already tried updating the Bluetooth drivers on your computer? My previous working laptop needed some driver upgrades for decent connectivity, for headsets but anyway. Another thing might be to try with different flow control settings as your problems are related to larger data flows. My adapter seems to have the flow control DIP switch in Off position, and it has worked fine with W7, W8 and W8.1, using Putty’s default settings (except the port name obviously). Yeap I tried it all, no flow with flow you name it. The lappy is HP elitebook brand new from my company win 7 prof. I tend to believe I got a dud. sh run is not really an extreme command. Well apparently that was due to BT driver issues and some other settings. I take that back, it works well. Good to hear, thanks for updating the situation. Hi Markku, any idea how to get power from 9pin to power SD-1000 Bluetooth device? Hi Miles, unfortunately I haven’t tested it with any device with DB9 serial port. All the devices I’ve been working with so far have been equipped with RJ-45 console ports. But as far as I understand it, the DB9 serial port has one pin for the power, so it should not require anything special to take advantage of it. FYI, Latest version for SecureCRT (at least on OS X) disconnects BT connection to the SD1000. Hola , mi nombre es Martin Chaverri desde Costa Rica, soy topografo y tengo una estacion total Sokkia 530RK3, no tiene blutooth integrado , quiero adquirir un colector de datos que sí tiene blutooth, quisiera saber si con el SD1000 conectado a la estacion Total puedo estar seguro de que habrá comunicación?